Cozy Cabin with Gas Fireplace, 2 beds and a Queen Sofa. 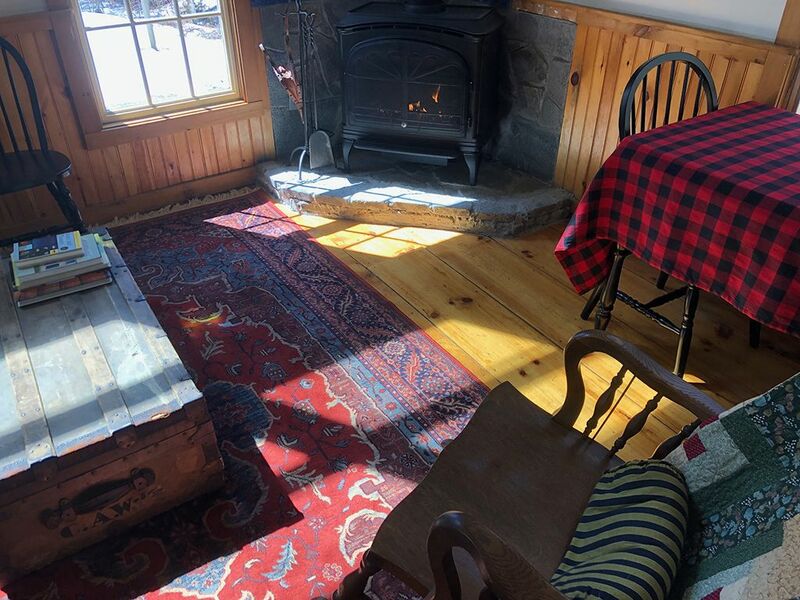 Enjoy the beauty of Vermont at our private cabin. Situated on acres of wooded land next to a babbling brook, the cabin is 18 minutes to Okemo Mountain and 15 minutes to the Green Mountain National Forest and White Rocks. Featuring a queen bed, a double bed and a queen pull out sofa, the cabin is most comfortable for up to 4 people but can also sleep 5. Prepare your own meals in the full kitchen, cook outside on the outdoor grill or visit nearby restaurants and have the perfect trip to Vermont. Down a private road and surrounded by woods the Cabin features a queen bed in a sleeping loft, a double bed in a small bedroom and a queen pull out sofa in the living room. The living room with its cathedral ceilings and a beautiful gas stove is the perfect place to sit by the fire and enjoy the scenery inside and out. A fully equipped kitchen contains everything you need to prepare meals including a full sized oven, microwave, refrigerator/freezer, kuerig coffee maker, plates, glasses and cooking utensils. The Belmont General Store is about 1 mile away and dozens of restaurants and a supermarket are located in Ludlow at Okemo Mountain so you won’t be too far from all the necessities. Bring your snowmobiles and ATV’s and park them right at the Cabin! We keep the driveway to the Cabin plowed and live about 500 feet away from the Cabin so we are available to answer questions, greet you upon arrival and make sure you have everything you need during your stay. Once settled in you will enjoy all the privacy of the Cabin, the natural beauty of its surroundings and be within reach of all the local attractions. We are about 1 mile off the paved roads so 4 wheel drive is advisable for heading our way in winter conditions. The cabin comes with fiber optic high-speed internet and wireless phone service is available thru the internet connection. We do allow pets but if you want to leave them unattended during the day we require that you have them in a crate so that we can enter the cabin if needed. After a long career in hospitality in Boston and NYC my partner Tom and I moved to Vermont to have a better quality of life, to enjoy the peace and spend our time working on our property. We love it here and want our guests to feel the same. In the Belmont section of Mount Holly, we are close to major roads but secluded in the woods. You will be able to head to a variety of restaurants and shopping within 20. We had an absolutely amazing stay in this beautiful, cozy cabin in the woods. Darrin was such a warm and welcome host. They had received over a foot of snow into the morning we arrived-it was beautiful, especially because the driveway was nice and cleared for us. We look forward to coming back to stay again!! The Belmont General Store is one mile from the house. Good for pantry basics, sandwiches beer and wine.